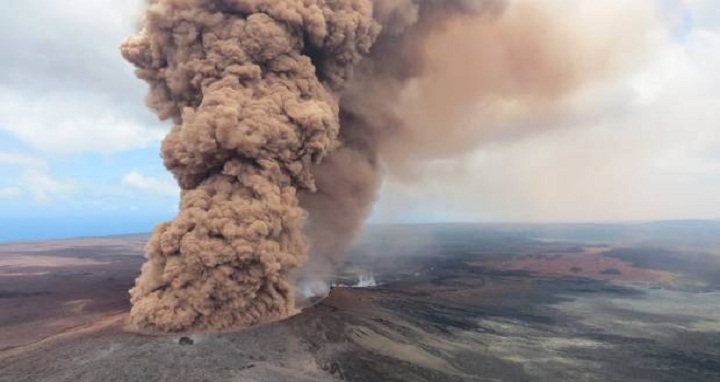 Dhaka, 6 May, Abnews: Sputtering lava, strong earthquakes and toxic gas jolted the southern part of the Big Island of Hawaii as magma shifted underneath a restless Kilauea volcano. The trifecta of natural threats forced stressed out residents to evacuate and prompted the closure of parks and college campuses on Friday (Saturday NZT). Multiple new vents, from which lava is spurting out of the ground, formed in the same residential neighbourhood where molten rock first emerged on Thursday. At midday, a magnitude 6.9 earthquake struck - the biggest of hundreds of quakes this week and the largest to strike the state in 43 years. Residents were also warned to watch out for dangerous levels of sulfuric gas. Officials ordered more than 1700 people out of Big Island communities near the lava, warning of the dangers of spattering hot rock and high levels of sulfuric gas that could threaten the elderly and people with breathing problems. Two homes have burned. Julie Woolsey evacuated her home late Thursday as a volcanic vent, or an opening in the Earth's surface where lava emerges, sprouted up on her street in the Leilani Estates neighbourhood. Lava was about 1000 yards from her home, which Woolsey built on a lot purchased for US$35,000 (NZ$49,855) 11 years ago after living on Maui became too expensive. Local authorities held a community meeting with residents from lava affected areas on Friday night at Pahoa High School. Two new volcanic vents, from which lava is spurting, developed on Friday, bringing the number formed to five. State Senator Russell Ruderman said he's experienced many earthquakes, but the magnitude-5.4 temblor that hit first "scared the heck out of me". Merchandise fell off the shelves in a natural food store he owns. The University of Hawaii at Hilo and Hawaii Community College both closed campuses to allow students and employees to "attend to personal business and priorities". Brad Stanfill said the lava was more than 5 kilometres from his house but he was not allowed in because of a mandatory evacuation order. He was frustrated because he wanted to feed his rabbits and dogs and check on his property. Leilani Estates has about 1700 residents and 770 homes. A nearby neighbourhood, Lanipuna Gardens, which has a few dozen people, also has been evacuated. The crater floor began to collapse on Monday, triggering earthquakes and pushing the lava into new underground chambers. The collapse caused magma to push more than 16km downslope toward the populated southeast coastline.